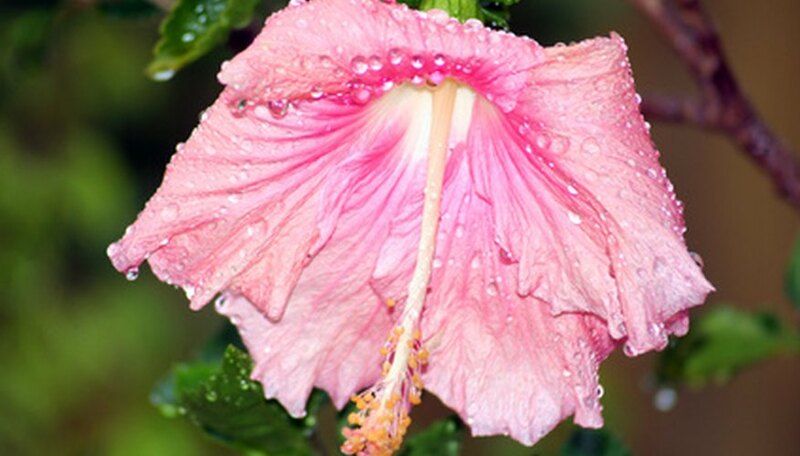 Rose of Sharon is scientifically known as hibiscus syriacus and more commonly as althea or althaea. It needs little care and only regular watering to thrive. Rose of Sharon is resistant to most diseases but can still contract a few, primarily fungus diseases. Good planting and maintenance practices will prevent most of the diseases from affecting the Rose of Sharon. Leaf spot is a fungus that can affect a wide variety of plants, including Rose of Sharon bushes. Circular or patchy brown or black spots often with a yellowish edge appear on leaves first. Next, the leaves begin to fall from the bush. Left untreated, the loss of leaves can kill the bush. Remove and destroy any leaves with spots. Also remove and destroy any leaves that have fallen around the base of the bush. Treat the bush with foliar fungicides to prevent the spread of the fungus to the rest of the bush. Though it causes very little damage to most plants, powdery mildew is an unsightly fungal disease that affects Rose of Sharon bushes. It appears as grayish or white spots on the leaves, stems buds and flowers. It can cause leaves to curl and drop and cause buds to become deformed. The fungus overwinters in plant tissue and releases spores in the spring. Most often it can be left untreated. If the disease returns year after year, it may need to be treated by moving plants to a sunny, dry location and removing all dead debris from around the plant. Treat with a fungicide at the first sighting of spots in the spring to be effective. Botrytis blight, also known as gray mold, attacks the unopened buds of the Rose of Sharon bush. The foliage looks fine and buds form in the usual way but give the appearance of rotting from the inside out. Botrytis blight is a fungus. All buds should be removed from the bush. Any fallen leaves or buds should also be removed and destroyed as the fungus overwinters in the debris. Treat the bush with foliar fungicides to prevent the spread of the fungus to the rest of the bush. Cotton root rot is prevalent in alkaline soils like those found in Texas. In some areas the disease is called Texas root rot. Leaves and branches will wilt and die but remain attached to the plant. The disease is diagnosed by examining the roots of the affected plant at a 10X magnification to identify light brown strands or webs. The fungus invades the soil and the bush should be transplanted to a container using sterilized potting soil. Soil treatment must be done by a licensed applicator at one- to two-year intervals. Only plant specimens that are resistant to cotton root rot in affected soil. Canker is inverted blisters that form on the bark of shrubs and trees. Fungi cause cankers on the trunks and branches. At some point during the growing season, the cankers will ooze sap. Leaves may turn yellow and drop on established wood while new shoots may not develop leaves at all. Left untreated for several years, canker can kill the bush. Once canker is discovered, the affected limb should be cut off. If the outbreak is on the main trunk, the tree may need to be replaced as there is no treatment for canker. The best prevention is to follow good care management.